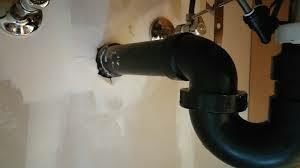 Not all sewer pipe problems can be fixed with simple sewer repair services. Although most residential and commercial sewer main line pipes will last for decades after the initial sewer installation, ongoing corrosion, sewer line collapse from tree root damage, and other problems can lead to the need for partial or complete sewer pipe replacement. Replacing the pipe will often require sewer excavation, although alternative trenchless solutions like pipe bursting can also be effective in many situations. At A1 Sewer & Drain Services, our skilled NJ sewer plumbers have years of experience replacing residential, industrial, and commercial sewer main lines. To find out more, or to schedule service today, call us any time at 201-645-0888. Sewer pipes that are collapsed or severely damaged will need to be replaced. 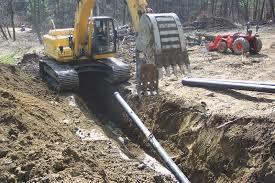 Excavation is the most common approach for sewer replacement in NJ. Sewer excavation is a relatively intensive process, requiring us to use heavy equipment to expose some or all of the pipe so that it can be replaced. Sewer replacement with excavation is suitable in many serious situations, when the pipe is too badly damaged to be repaired. Very old sewer pipes. Old sewer pipes on your property can be a disaster waiting to happen. Most sewer line materials have a surprisingly long lifespan, but eventually, the pipes will degrade and need to be replaced. Aging sewer pipes can be a problem on older properties in NJ, and may need to be replaced by homeowners to prevent backflow or a sewer pipe collapse. Collapsed sewer pipes. When a sewer line falls apart and collapses completely, whether from corrosion or tree root intrusion, it’s beyond the point of repair. You’ll need sewer replacement immediately. For collapsed sewer pipes in NJ, call us any time at A1 Sewer & Drain Services for 24/7 emergency service. Severe tree root incursion. 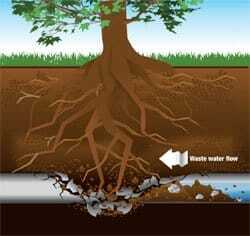 When tree root incursion is extreme, hydro jetting may not be enough to remove the roots, and the pipes may be so damaged that sewer relining won’t necessarily be effective. Severe corrosion or scale buildup in copper or cast iron sewer pipes. While PVC and other modern materials are largely resistant to corrosion, metal pipe are not. Although metal sewer pipes have a special protective layer, this layer can wear away over decades of use, exposing iron or copper to ongoing corrosion from bacterial hydrogen sulfide and other chemical reactions. 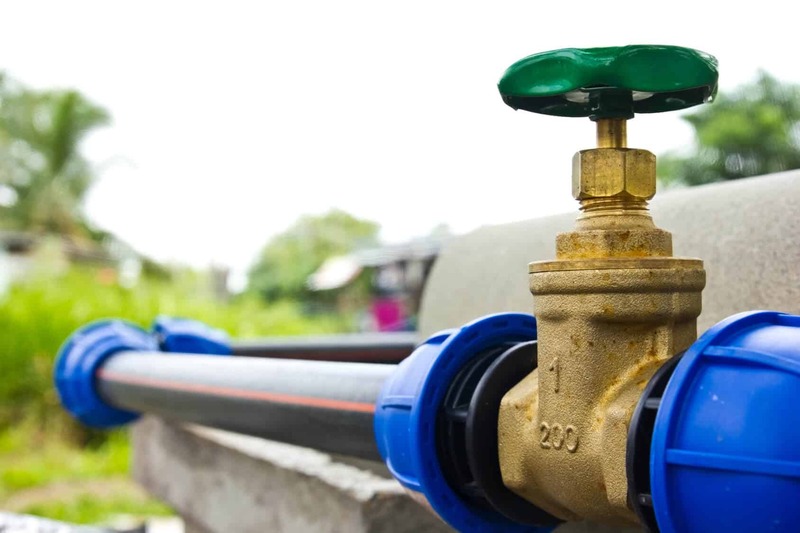 Metal pipes can also be susceptible to scale, deposits of minerals that accumulate along the bottom and sides of the pipe and obstruct water flow. 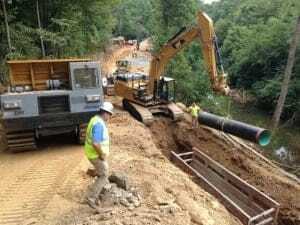 Serious scale or corrosion often warrants sewer line replacement. When you need sewer replacement with sewer excavation in NJ, you’ll have several options for the material. Sewer main lines can be made of several different types of materials, with their own unique benefits about drawbacks. PVC. 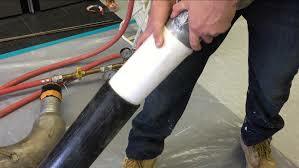 Polyvinyl chloride (PVC) pipe is commonly used for pipes, as it’s water-resistant and inexpensive. After 50 years, PVC loses around 65-80% of its strength, and the links between molecules themselves can begin to fail. Although it has a relatively poor lifespan as far as plumbing pipes go, PVC is still a sturdy and economical option. It’s highly resistant to many kinds of corrosion, including microbial hydrogen sulfide corrosion, although it can deteriorate in soils contaminated with benzene. Copper. Copper is sometimes found in residential sewer lines, and has a relatively long lifespan (up to 100 years). However, it’s more common in smaller household drain lines. Copper can be subject to corrosion, scale, and other deterioration over time. Cast iron. Cast iron was once the most common material for wastewater lines in NJ. After many decades, these cast iron pipes can deteriorate and corrode, causing underground water leaks, sewer backups, and other problems. Some homes built before the 1970s may still have old cast iron sewer pipes, which may need to be replaced. Uncomfortable with sewer excavation that digs up your yard and lawn? In many cases, we can replace your sewer main line with pipe bursting instead. Pipe bursting is a trenchless solution for sewer replacement, using a hydraulic bursting head to break an old pipe apart and pull a new one into place. Many NJ homeowners prefer pipe bursting, since less excavation is required. To find out more about pipe bursting, sewer excavation, and other solutions for licensed sewer repairs nj, call us any time at A1 sewer services NJ, at 201-645-0888.